A Hot meal is served followed by dessert and a cup of tea for £2.50. 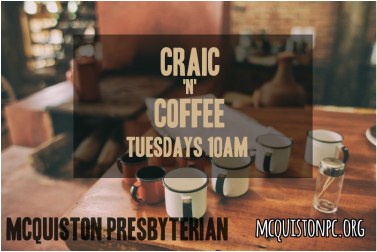 On Tuesday Mornings, we invite you to Craic 'n' Coffee! 'Craic n Coffee' is our Community Drop-in Cafe and meets at 10am! Coffee and buns are FREE!!! Why not come along and get to know your neighbors! 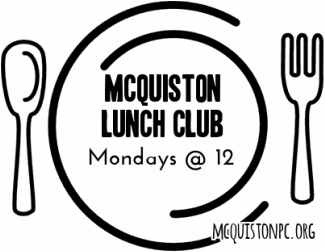 The McQuiston Senior Members has been in existence for many years now and meets every Tuesday from 1.45pm to 3.30pm. If you are over 60 please do come along and join us. Our aim is to have all the elderly in the church and the community to come to us on Tuesday so that we can witness for Jesus and show his love to all. If you would like further assistance please contact here (twinkletoes59@hotmail.com). 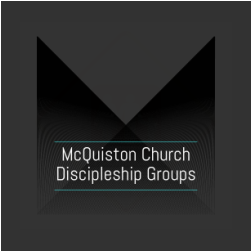 McQuiston Discipleship Groups meet throughout Belfast on Tuesday Mornings, and Wednesday Evenings. They provide opportunities to 'Go Deeper' in your Christian Walk, and to share life with other Christians. 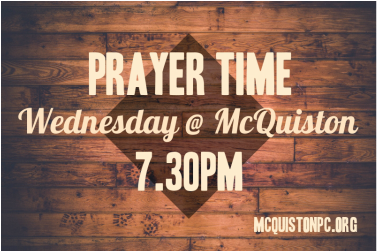 On Alternate Wednesday evening we gather to pray for our Community at 7.30pm. We Also meet together to Pray each Sunday night at 6.30pm. Please let us know if we can pray for you. Send Prayer Requests as a Private Message on Facebook. You would be very welcome to come along. You don't even need to pray out loud to join in!